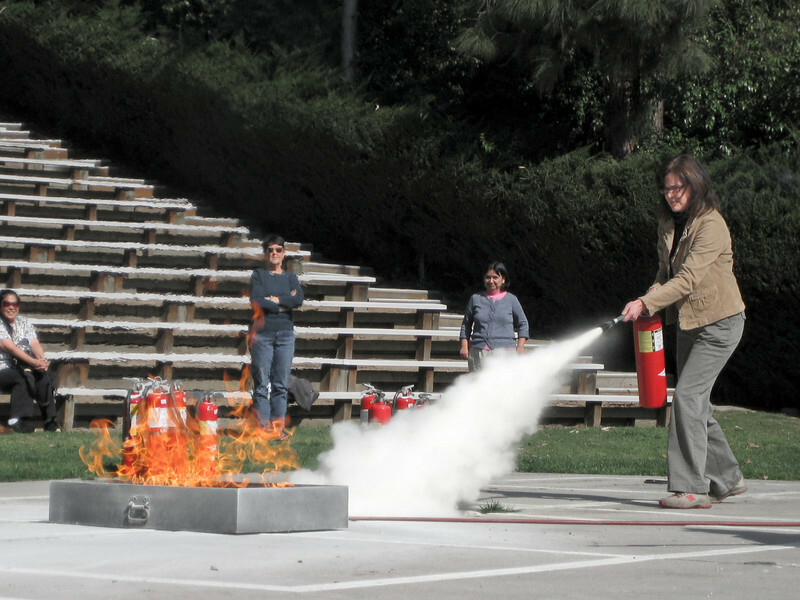 Today at work I attended a fire extinguisher training and we all got to put out a fire, it was fun! This is my fellow employee Monique, with other coworkers looking on (there were about 20 of us total). If you think she's missing the flame, don't worry, she got it out very quickly! I took many, many photos, most of which were throwaways, but I like this one because it shows the propellant (basically baking soda) and the flame at the same time. The heat from the flame makes some neat ripples in the air, too. I slightly desaturated this photo except for orange and red. If you're curious, the metal container is filled with water, and the hose attached is propane, which bubbles up to fuel the flame. Our fire fighter instructor relit the flame after every person with a flare attached to a long handle. Nice photo! Reminds me of years ago when we did this drill in the hospital parking lot! I bet you had lots of laughs whilst learning!